The House iteration sponsored by Reps. Ryan Costello (R-Pa.) and Collin Peterson (D-Minn.) allocates $30 billion over three years at the full discretion of the HHS secretary. It would also consolidate a federal reinsurance program as the House GOP leadership tried to do through their failed attempt to repeal and replace the Affordable Care Act. It also includes retroactive funding of cost-sharing reduction payments for the rest of 2017 and future funding for 2019. The Costello bill has the support of the House Energy and Commerce Republican leadership. Co-authored by Sens. Susan Collins (R-Maine) and Bill Nelson (D-Fla.), the Senate's proposal would leverage 1332 waivers to let states draw down from a $2.25 billion pool—available annually for two years—for their own reinsurance program. Collins said she's discussing the House approach to reinsurance with Costello and Energy and Commerce leadership, and she noted that these talks are progressing well. But while she liked the higher funding levels of the House provision, she is adamant the reinsurance mechanics of her bill will help states the most. This is because 1332 waivers let states patch together more funding for their pools using pass-through payments from the federal government that would have been used for premium tax credits. This potentially multiplies the impact of the original reinsurance money. In short, she said, "I like the 1332 approach but think a third year (of funding in the House bill) is a good idea." For Costello, the advantage of a federal reinsurance fallback instead of the 1332 approach is its "speed, efficiency and certainty." "If you have to go through the waiver process, you don't know whether you can get it or not," Costello said, noting that eliminating the wait time and uncertainty of getting a waiver approved cuts the path to getting it done. "We know what we want to achieve out of this, so let's allow states to do it." 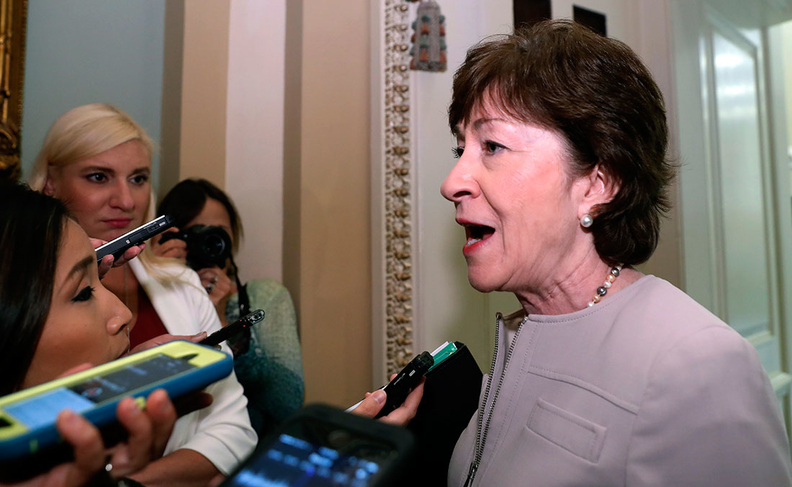 Collins, who had stuck to her push for individual market stabilization even through murky and often hostile politics, has secured a commitment from Senate Majority Leader Mitch McConnell (R-Ky.) that her measure will be brought to the floor. McConnell originally committed to including the measure along with the deal struck by Sens. Lamar Alexander (R-Tenn.) and Patty Murray (D-Wash.) in the December spending stopgap. Collins acquiesced to pushing the effort into 2018 when House conservatives opposed it. Currently, it's unclear which proposal the GOP House and Senate leaders will come together to support. As talks ramp up around stabilization in the House, some lawmakers want to introduce measures that broaden the risk pool or address association health plans, but Costello is hoping to keep things simple. "The objective is to have a contained, modest bill in terms of its reach because it's so critical that the provisions are implemented," he said. While insurers are buzzing about the prospect of reinsurance, the actual market impact of both the Senate and House proposals remain, as actuarial consultant Nick Ortner said, the "billion-dollar question." It's the details of where the money is allocated that will determine how far it will go, Ortner noted. Will reinsurance cover high-cost pharmaceuticals? Will states or the HHS secretary—depending on which measure passes—exclude certain high-cost claims from qualifying for the funds? Insurers will also be watching for the claim levels at which the reinsurance money can kick in, as well as the overall healthcare cost trends and whether the government's allocated funds can keep up with increases in healthcare costs. "The devil would be in the details of how state marketplaces might use that money," Ortner says. Other healthcare policy analysts are skeptical how much either proposal could bolster the individual market now that the individual mandate penalty is gone. "It can help to reduce premiums, particularly for the unsubsidized population," says Eliot Fishman of the advocacy group Families USA. "But it does nothing to improve affordability for people getting subsidies. It does nothing to improve the risk pool for the exchanges. All it does is try to contain some of the damage of a poorer risk pool." As always in the House, the wild card for support is in the hands of the conservative wing that has long staunchly opposed CSRs as a "prop-up" of the ACA. But Costello said with 2019 filing deadlines approaching that's short-sighted and defended his bill as a pivot from the ACA in that it doesn't depend on 1332 waivers. "What I would suggest is moving away from 1332 waivers is moving away from Obamacare in the sense that we're no longer asking the federal government to police whether state-run programs can do something or not," he said. Correction: An earlier version of this story incorrectly stated the House bill was only sponsored by GOP lawmakers. This error has been corrected.